Whether you are an experienced Twitter user or a newbie, Twitter chats are a useful feature many users are missing out on. These chats provide benefits to both individuals and companies, yet many either forget or simply don’t know about them. Perhaps this is because they are a bit tricky to understand, especially the first time you want to participate in one. However, it doesn’t take long to become a pro! 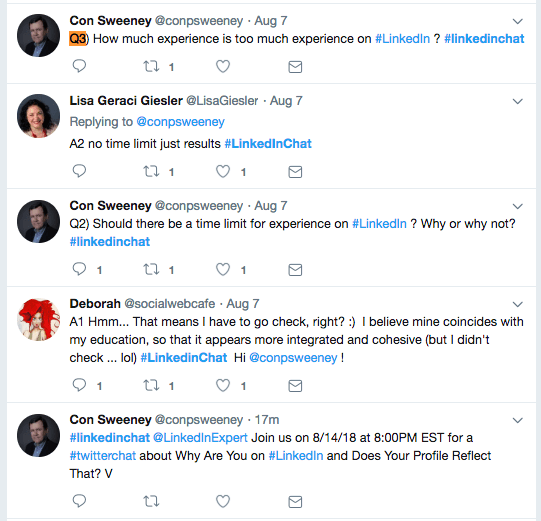 Whether you want to host your own or interact with someone else’s, Twitter chats are an easy way to engage with your peers and target audience by asking targeted questions or providing answers to the community. In this article, you’ll learn the best ways to use Twitter chats to network and learn. But first, you may be wondering: What Exactly Is A Twitter chat? What Are The Requirements For A Twitter chat? Put the conversation first (Not yourself). In short a Tweetchat or Twitter chat is a scheduled, organized topical conversation on Twitter centralized around a specific hashtag. It’s best to think of a MeetUp or panel discussion around a specific topic. Now bring that conversation into the digital world of Twitter, a platform designed for high engagement through bite-sized content in the form of tweetings containing 280 characters or less. Put them together and presto — you have a Twitter chat! A specific time — this is often a regularly occurring time, such as Mondays at 2 p.m.
A moderator posting questions, using the format Q1, Q2, Q3, etc. Participants answering the questions, using the format A1, A2, A3, etc. Twitter chats usually last for an hour and have six-to-12 questions. While that may not seem like many questions for 60 minutes, the time goes quickly — especially when you have a large number of participants! One of the biggest advantages of Twitter chats is perhaps the most obvious — you can grow your social media following. The best way to reap this benefit is by interacting with the moderator and others involved in the chat, as we’ll discuss below. In addition to the number of followers you have, Twitter chats increase your brand awareness as a whole. Hosting a chat brings your target audience to you. You can listen to members of your audience, learn how to engage them, and get ideas for your content marketing strategy. Chats provide an opportunity for professionals around the world to meet and share their expertise. When you participate in a chat, you display your thought leadership — especially if the moderator retweets your answer! Twitter chats also give the ability to learn from your peers. A marketer on the other side of the country could have a tip or tool that solves that challenge you’ve been struggling with for the past month. Alternatively, you can also find inspiration from others and get the creative juices flowing. Even seasoned content marketers may be a little foggy when it comes to participating in a Twitter chat. They’re not all contained in the same thread, making them more difficult to follow. Find a Twitter chat you would like to participate in. 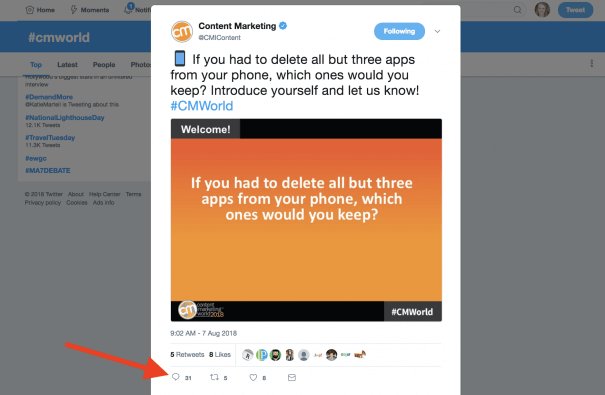 (You’ll find several for marketers throughout this article or Huffington Post shares its 10 best chats for entrepreneurs or find 25 great twitterchats at 99signals) Then, at the designated time, log onto Twitter and type the hashtag into the Twitter search bar. You can also go to the moderator’s profile page. Many Twitter users create a new tweet when answering a question, be sure to use the Twitter chat’s hashtag, of course! Now that you know the basics, let’s look at some tips to make the most of your time on Twitter. Don’t feel the need to answer every question. You will still benefit from watching the conversation, learning from your peers and industry experts. On the other hand, don’t hesitate to jump in and make the most of the answers that show off your expertise. Doing this will make people notice and appreciate your participation. This is especially beneficial when you have a unique point of view. Speaking of engaging with your community, don’t just reply to the moderator’s questions. Like and respond to the answers of other participants. This is how true conversations get started in the digital world. In addition, it’s how other Twitter users will get to know you, increasing the likelihood they will engage with your other activities on Twitter. If you want to increase your followers on Twitter, the best way to do it is by following those who also participate in the conversation. Given you are interested in the same topic and they’ve just interacted with you, there’s a good chance they will follow you back. Okay, so maybe you don’t have to go crazy, but GIFs are a huge part of Twitter chats. They give an emotional response to your comments. You can also comment quickly, without needing to craft the perfect 280 character response. Plus, they’re fun! People love them, and a clever GIF is a positive reflection on your social media skills. In case you couldn’t tell, Twitter chats are meant to be fun! To host a Twitter chat, the first thing you will need is your chat hashtag. It can be related to your brand or the content topic, but it should be short, memorable, and unique. Short: The longer your hashtag, the fewer characters participants have to include with their reply. Memorable: Choose a hashtag that is easy to remember. This ensures that Twitter users can find you, and it makes it easy to participate in the conversation. Unique: Hashtags that are easy to remember are also common. You also need a hashtag that is unique to you. Otherwise, those wanting to find your chat may get confused by the other results that appear with your hashtag. Next, consider the time of your chat. Twitter chats get the best long-term results when they are held on a regular basis, such as weekly. Examine your audience and their location. In America, you will want a time that works for those on Eastern and Pacific time. Some choose to hold their chats during business hours, others prefer at night. Think about your audience when choosing your time. Aside from their locations, are they more or less likely to participate during business hours? Once you have decided to on your Twitter chat’s time and hashtag, just like all types of event marketing, you need to promote the event. Any event is meaningless without attendees, and that applies to the digital ones too. Without participants, you don’t have a Twitter chat — you simply have a series of tweets. Announce your Twitter chat across all channels, including other social media platforms, your website or blog, and within email newsletters. Knowing that Twitter is where the event takes place, pin a tweet to your profile that promotes your Twitter chat. 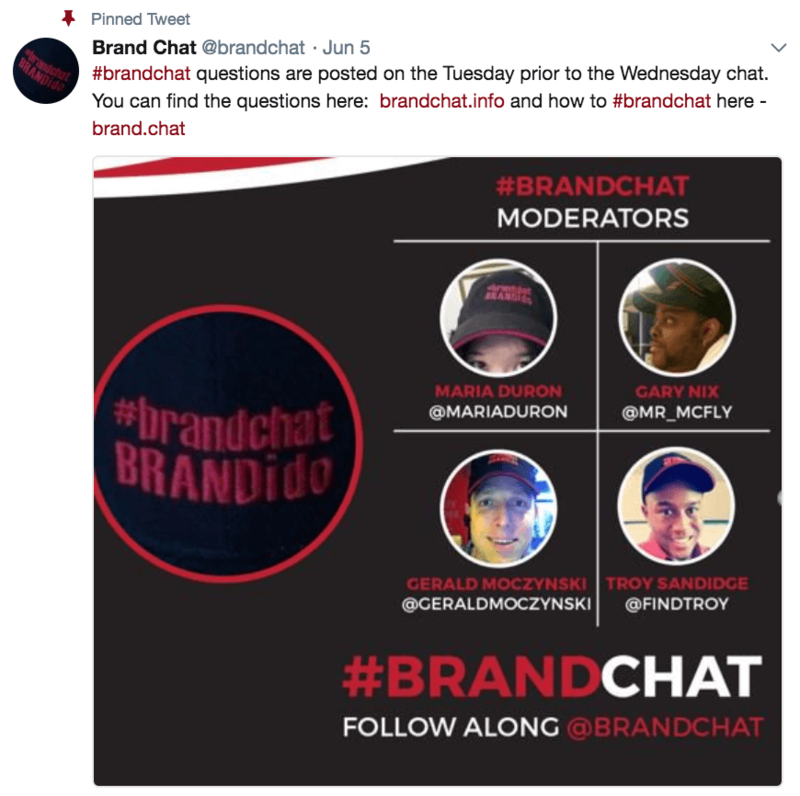 If chats are a big part of your Twitter strategy, you could also make a Twitter header image that includes the chat date, time, topic, and hashtag. Have all of your questions written and scheduled before the chat begins. Wait five-to-10 minutes between questions, giving participants time to respond. Interact with your participants — comment, like, and retweet the top answers. Stay focused! An hour-long Twitter chat will have you racing among questions and participants. Take your bathroom break and have coffee ready before it begins! Don’t forget to promote any prominent guests participating in or moderating your chat. Doing this before your chat will increase participation. Plus, you are making it easy for influencers to retweet posts that mention them! After the Twitter chat, it’s time to maximize on that benefit of creating content. 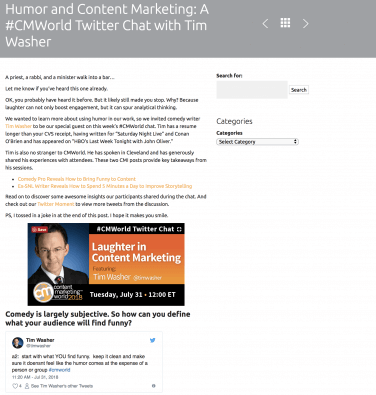 Build a blog post that highlights key tweets and lessons from the chat. The search function and categories Content Marketing Institute uses enable readers to stay on its site and continue engaging with its brand. Blog posts ensure your Twitter chat has a lasting impact, even when it has fallen to the bottom of your Twitter feed. Twitter chats provide a valuable opportunity for both companies and individuals. Share your expertise and get to know the other chat participants. Like, comment, and retweet posts from the moderator and other attendees to maximize your exposure and engagement. Then, be sure to follow those engaged with that chat. Those participating in Twitter chats have a sincere interest in the topics being discussed. And best of all, when you are the host of a Twitter chat, your name is associated with the source of that knowledge exchange.